Located at 1532 N. Walnut Avenue. in New Braunfels, Texas, our office is in a white brick building with a green roof. 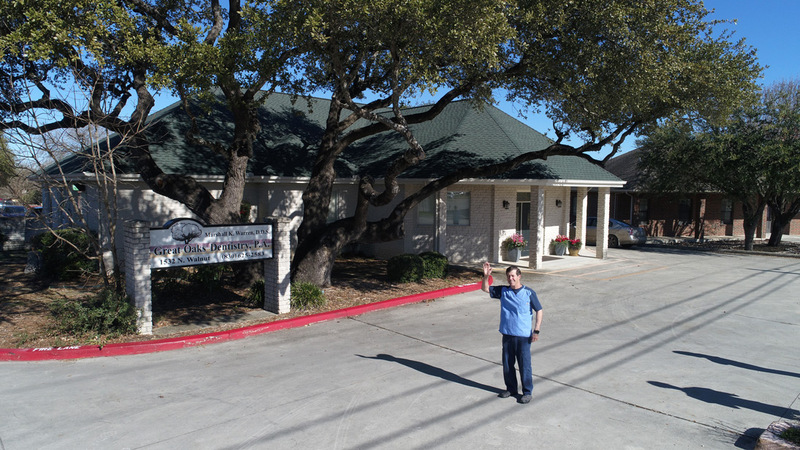 A beautiful Texas live oak tree stands as a marker for the offices of Great Oaks Dentistry, P.A. We are located across from The Oaks Shopping Center and next to Kirkwood Manor Nursing and Rehabilitaion Center. Access from Hwy 46 West Hwy 46 west turns into Walnut Ave. under Loop 337. Look for the office on your left past Kirkwood Manor. Access from Hwy 46 East – Hwy 46 East joins Loop 337. Merge onto Loop 337 southwest. Exit Walnut Ave or Hyw 46 West, turn left under Loop 337. The office will be on your left.